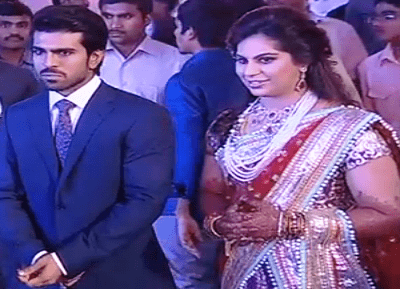 Southern Actor and Son of Super Star Chiranjeevi, Ram Charan Teja got married yesterday with his childhood friend Kamineni Upasana. 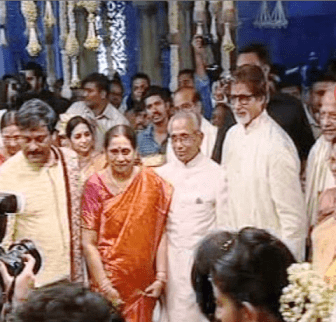 It was truly Big Fat Wedding, where many politicians and bollywood celebrities spotted like Amitabh Bachchan, actress Sridevi, Boney Kapoor, Rajinikanth, Tabbu and many more. Andhra Pradesh Governor ESL Narasimhan, Chief Minister N Kiran Kumar Reddy, Tamil Nadu Governor K Rosaiah were present there too. 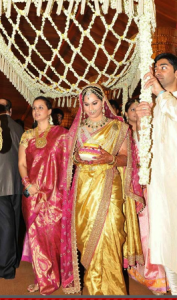 Bride Kamineni Upasana and Groom Ram Charan Teja chose Tarun Tahiliani for their wedding Dress. Bride Kamineni Upasana was wearing Tarun Tahiliani’s designed Yellow Golden Silk Saree with swarovski encrusted border done with zardosi French knots and a sprinkle of tiny soldered stones. This will be complemented by a rani pink zardosi corset blouse and a rani pink tulle veil. Whereas Ram Charan was wearing coordinated dhoti, paired with a fine chikan kurta and stole again by Tarun Tahiliani. 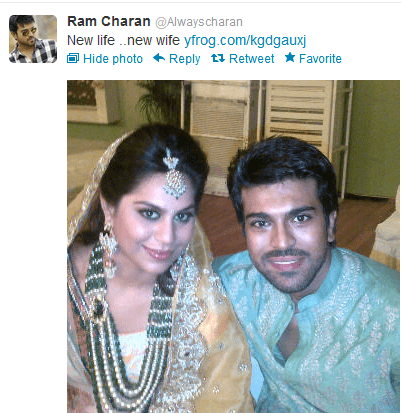 Groom Ram Charan Teja is a Son of Superstar Chiranjeevi who is an actor and Politician too. He is a Congress leader. Ram Charan is coming with his next firm Zanjeer which is a remake of movie Zanjeer made in 1973 where Amitabh Bachchan was in lead role. Priyanka Chopra will be heroin in Ram Charan’s movie Zanjeer. While Asked about their honeymoon he said: “It will be just 4-5 days long honeymoon as I have to get back for Zanjeer’s shooting” and though it will be short honeymoon it will definitely in India only that is what Ram Charan said about his honeymoon plans. Bride pasana Kamineni is the granddaughter of Dr. Pratap C Reddy, Chairman and Co-founder of Apollo Hospital, the largest chain of Private hospitals in India. 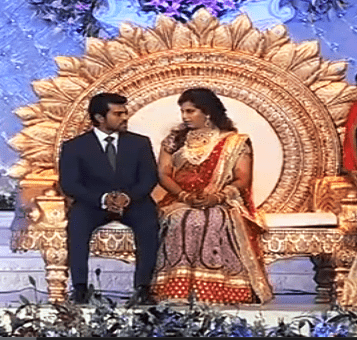 Ram Charan and Upasana Kamineni throw lavish reception on the same day. More than 5000 people attended their reception. Even celebrities were spotted in queue, while waiting to meet newly Wed couple Ram Charan Teja’s Wedding and Kamineni Upasana. « Myfashionvilla loves glasses of Designer Narresh Aka Shivan & Narresh : So Cool! So Stylish!